As recently reported in the New York Times, a girl born today can expect to live to the age of ninety, on average (boys, on the other hand, can expect to live until age eighty-five). Life expectancy, for many, is increasing, yet people rarely contemplate the emotional changes that come alongside the physical changes of aging. Madeleine wants to change that. Coming of Age: My Journey to the Eighties takes a close and incisive look at what it is like to grow old. 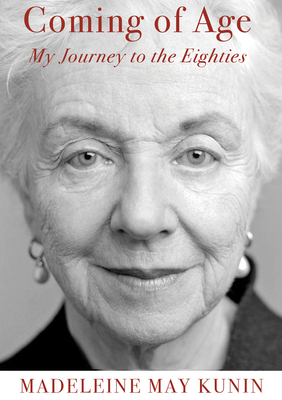 The book is a memoir, yet most important of all, it is an honest and positive look at aging and how it has affected her life. Cover photo © Todd Lockwood. Governor Kunin has written three previous books: Living a Political Life (Knopf), and The New Feminist Agenda: Defining the Next Revolution for Women, Work, and Family (New York Times Editor's Choice) and Pearls Politics and Power. She has more energy than two 40-year-olds. She is currently James Marsh Scholar Professor-at-Large at the University of Vermont where she gives lectures on feminism and women and politics. She also serves on the board of the Institute for Sustainable Communities (ISC), a nongovernmental organization that she founded in 1991, and she recently launched Emerge Vermont to encourage and support women in politics. She lives in Shelburne, Vermont. Author photo by Paul Boisvert.